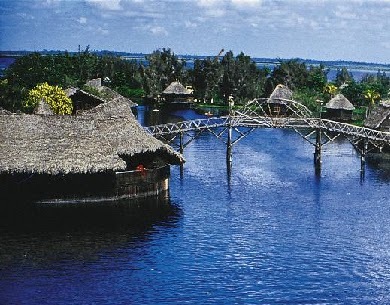 Located on the southern coast of the western province of Matanzas, about 180 kilometers southeast of the city of Havana, also becomes the largest and most important wetland in the Caribbean islands and a natural reservoir holder of fragile ecosystems. With an area of four thousand 520 square kilometers, lies the Zapata Swamp National Park, which is accessible by road. The number of its inhabitants is close to nine thousand, for an average density of only six people per square kilometer, the lowest in Cuba. In this territory there is a special kind of caves, tectonic freato-marine, which constitute the system of Zapata speleological open along a crack length of 70 kilometers and extended between the Bay of Pigs and Cienfuegos. They appear in the caves on the surface semicircular gaps that allow access to flooded galleries, many of which serve as channels to underground rivers. Another natural beauty of the park is the Laguna del Tesoro, with just over four feet deep and average almost 16 kilometers of surface, which rates as one of the mirrors larger fresh water on the island According to an old legend, in the sixteenth century, when Spanish conquistadors penetrated into the area, the primitive land inhabited enclave bordering the water, frightened, threw their riches to water, which gave rise to the name of Treasure Lake. From a conservation point of view stand within its fauna, manjuarí, considered a living fossil, found in the access channels, and the manatee, other traditional species endangered Cuba. Therefore water that space is increasingly popular and preferred by vacationers from all continents lovers ecology, sport and recreational fishing, and the wonders of the medium. Considered one of the most important areas of Cuba as greenhouse bird, the Zapata Swamp National Park has the Salinas de Brito, significant retreat with large concentrations of waterfowl, as sevillas, herons, flamingos and cranes. Ideal place for whale watching. Here the visitor finds a wide range of possibilities and who first incursions by the region and admire its natural beauty and historical values, determined to leave as soon as possible to return to continue enjoying this unique and wonderful holiday experience.